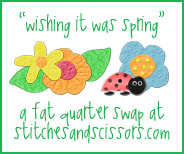 Stitches and Scissors: It's a Fat Quarter Swap! CLOSED. It's a Fat Quarter Swap! CLOSED. I have been having so much fun with all of the swaps and quilting bees that I have joined that I thought it was time that I hosted one. I am so excited to *meet* new people here in bloggy land. Everyone is welcome in this swap, if you would prefer to not ship yours internationally let me know and I will match you up with someone from your neck of the woods. Everyone will send out 2 Fat Quarters of fabric that is GORGEOUS and makes you wish for spring. A Fat Quarter is a 1/2 of a yard cut on the fold so that you have 2 pieces of fabric and each of them is a Fat Quarter. Therefor 2 Fat Quarters = 1/2 yard of fabric. I like how she put it, it totally made since to me and I GOT it. Before that I did not GET it. I hope that helps, if not check out this site for measurements. Please do not send anything that I like to call "Grandma Fabrics". Everyone loves to get nice Gorgeous fabrics so please don't send anything that you would not like to receive yourself. Also a note to pass along the bloggy love, I don't know about you but I love to find new great blogs! Of course, you are welcome to send anything else that you desire (Chocolate anyone?). It is all about having fun and waiting impatiently (or is that just me?) for your package to arrive and see what is inside. Please leave a comment on this post letting me know that you would like to join in. PLEASE post about this on your blog to get as many people as possible to join us! Once I get everyone partnered then I will email you with your partners address. You will have until the end of February to mail your Gorgeous fabrics out. I would love to be part of this! how fun. I would like to be in on this! Love your blog, and the layout is really welcoming! Please include me in this fun swap! :) I'll email u now. I would like to join if it isn't too late! Thanks! here is my email addy just in case. count me in! thanks for hosting. Please count me in! This is my first online swap of any kind so I'm very excited! Hope it's okay I'm in Canada! Thanks for hosting. I'm in too! Sounds like fun!! can I join? I am 10 years old, my mom is Stacey above. She said I could. I just got a sewing machine for Christmas. Add me to the list! This sounds like a blast!!! I just heard about this from little miss abby's (Abigail Carey) blog. COUNT ME IN! YEAH.... my first swap! I would love to join in. Thanks. Sounds like fun! A local craft store is having a Fat Tuesday sale so now I have an excuse to go! This sounds like fun! Please join me in! Count me in. This should be an easy enough swap! Gotta love those! I'd love to join, please and thank you! Gonna have to say no to this. I can't get anything done. I'll send you some flannel though. I got my fabrics yesterday and will sit down this weekend. I already had one of them and used a bit of it on my Project Improv blocks. Hope you don't mind! I'm definitely in! This is a great swap! Count me in! I had so much fun with Katy's swap. Count me in!! I would love to do this. I'd love to join in on the fabric swap. This is my first one so I'm super excited about it! I love fabric swaps like these! Funny you mention the change of weather in CA, earlier today it was sunny and blue skies, and now it is cold and raining! Some cheery fabric would be eat about now. im in the pieced together group too...fun to see so many of us here! Please include me! I need some sewing inspiration....I AM SICK OF SNOW! I would love to be in. Thanks for opening it up to newbies like me! I would love to!! I have lots of fat quarters to swap. So excited, I am definitely in! I would love to do this! Thanks for hosting! I agree with you and this weather, what's up with that?? holy crap...44 peeps already signed up!!! This sounds good. Please count me in! FQs are my weakness. Count me in. This would be my first online fabric swap, I have done tons of scrapbooking ones. Please let me join? my email is teresa@pomeranch.com. How many partners do you have and how many fat quarters do you send? please count me in! i'm fine shipping internationally, too. I would love to join and will ship where ever you need me to. Sign me up! I'm emailing you now! I'm in! Thanks for hosting such a fun swap. i found you from quilt dad & i would love to join!!! I'd love to join in! This sounds fun! This is great; I'd love to participate. 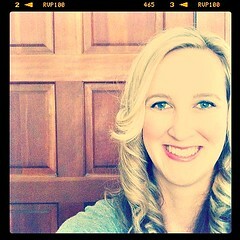 Thanks for doing this Darci!! Hi, Darci...I learned about your swap from Quilt Dad:) I'll email you...and then I'm going to take a look around your blog--looks like fun! Hi Darci - what can I say, I have been trying to resist but I'm in. I have so enjoyed my swaps so far. Count me in. I have lots of FQ's to trade with. I'm in! This would be my first swap and I am psyched (okay, I'm a dork, but whatever)! John over at Quilt Dad sent me your way. I'd love to do the swap! This is my first one too, but I definately have extra *cute* fat quarters! I'd like to join..I'll send my information! Oh yes please count me in. yes indeed, please include me! in in too! where ever is fine with me!! I'm in, too. I see my blog partner Sara beat me to this. . .but I'd love to participate. Email going out as soon as this is posted. I'm new here, but was looking for a swap--love your blog, and I'M IN!! Sure why not! I'm in! it'll be great! It's only two fat quarters. I'm in! I live in Australia but will happily post overseas. I would love to join such an easy swap with a wonderrul outcome of meeting such great new friends. Im in NewZealand and will happily post overseas. Oh what fun! count me in! This is my first swap, can't wait to see what everyone gets! I prefer U.S. only. Yes please, let me join this swap! There is always time for a swap like this. Please count me in on this swap. Thanks! Please count me in. I love the idea of such an easy and fun swap. I'm in Buenos Aires and (of course) will happily post overseas. I'm in! Thanks for organizing. I would love to be in this "think Spring" swap. We sure do need Spring in Northern Ohio. Count me in we could all use a little Spring and this sounds like just the thing!!!!!! Although I am dreading Srping, because of allergies, I would love to be in this swap. Sending you an email. Count me in! I would love to join your swap! I'm sending you an email. hello, love to join your swap, I have no blog, hope it is ok? I don't mind sending internationally. I would love to join in the Spring swap!! I am in Australia. PS-Melisa of Sweet Home rocks-here in Ga we call her the Evil Temptress! I would love to be in the fat quarter exchange. Please Add me to your list. I am in too. This will be fun. I am excited to be in! Sounds fun! How fun is this!!! I'm in!!! Oh, I am glad Katy at imagingermonkey posted about this! count me in! I would love to hook up with someone in the USA, if I am not to late! Sounds like fun to me. I have some good spring-y fabrics I'd like to share! I'd love to join! I just starting to quilt, so it'll be great to swap fabrics! Ok.I'd like to play along. I love getting stuff in the mail. I have some luscious Spring fabrics. Wow! Nothing like waiting until the last minute for me! So glad I found this. Please count me in! I just found this swap and would love to participate. I've never done anything like this so I would like to give it a try. I got my FQ's today! Yay! very springy! Thanks for the fun! Great swap. Thank you! I've posted my fabrics.